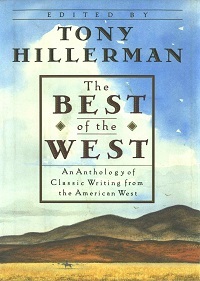 In this extraordinary treasury, Tony Hillerman, himself a beloved chronicler of the American West, has gathered over 140 remarkable texts from and about the West. Though these selections vary widely in form - from diaries to news dispatches to travelogues to short stories to stone inscriptions - everyone vividly evokes some aspect of the vast, rugged landscape west of the Mississippi and the unique souls who inhabit it. From white men's first tentative forays into the West to the highways that crisscross today's West, this anthology spans almost five centuries, celebrating many myths of a legendary landscape and exploding many more. Every facet of the Western experience is crystallized here - Indians, cowboys, Lations, frontier justice, homesteaders, the Pony Express, the mines, the railroads, the military, and far, far more. Included are such well-known documents as Chief Joseph's surrender speech and Colonel Travis's letter from the Alamo, as well as less famous but equally evocative texts like Custer's last letter home, the Tombstone Epitaph's report of the gunfight at the O.K. Corral, and a thoroughly bone-chilling account of a midwinter stagecoach ride.